Amazon today launched two unlimited tiers for its Cloud Drive storage service, while prominent dance music service Beatport has revealed it will be debuting on Apple's iOS. 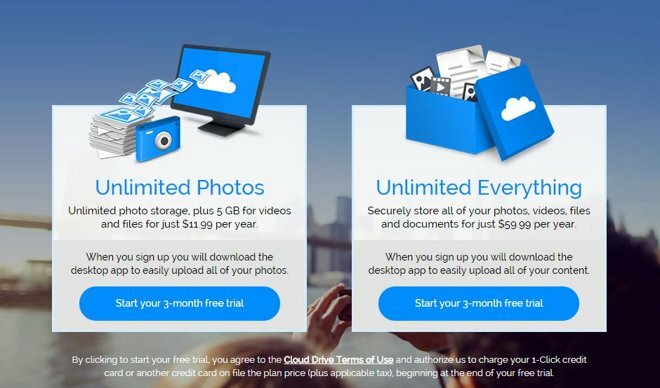 The Unlimited Photos tier lets users upload as many photos as they want at a cost of $12 per year. All other files are capped at 5 GB, but compatible images include the RAW formats used by professional photographers and serious hobbyists. The other tier is Unlimited Everything, which lets subscribers upload as much of they want of any file type for $60 per year. That option is currently rare in the cloud storage world —1 TB plans from Dropbox and Google Drive cost $99 and $120, respectively. The new Amazon plans each come with a three-month trial period, after which a person's credit card will be charged automatically. Desktop, iOS, and Android apps are available, the latter two of which can automatically upload photos for backup. Beatport has announced that later on Thursday it will be launching new mobile apps for iOS and Android, offering access to several features previously relegated to the web. These include a free streaming service, and Beatport Shows, a calendar of events with integrated ticket purchases. Beatport is owned by SFX Entertainment, which organizes many electronic dance events. For DJs the apps incorporate Beatport Live, which allows live streaming and gathers together social media activity from popular acts. T-Mobile has been announced as a partner for the launch. The carrier offers a perk called Music Freedom, which excludes various music services from contributing to subscribers' data caps. Beatport is best known for Beatport Pro, a DJ-oriented storefront for dance music, which also has a native Mac client.